Up until the day Lehman Brothers collapsed in September of last year, it took the Fed 5,012 days — 13 years and 8 months — to double the cash currency and reserves in the coffers of U.S. banks. Even the Fed’s response to the biggest emergencies of the recent past was far smaller by comparison: Before the feared Y2K crisis and after the 9/11 attacks, the Fed’s money infusions were 14 times and 25 times smaller, respectively. Moreover, they were quickly reversed as soon as the crisis subsided. This time, the Fed has done precisely the opposite: Despite its largest money infusion of all time in late 2008, the Fed has added still more reserves in 2009! Martin Weiss: Welcome to our online seminar on what may well be the most urgent financial and strategic dilemma of our time — the threat to the cornerstone of our nation, the threat to the value of the U.S. dollar. 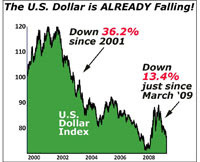 The dollar is careening toward its lowest level in history! Gold is going through the roof right now, plowing past every barrier, surging to its highest level of all time. Major oil producers all over the world are talking about abandoning the dollar as the basis for global oil contracts, right now! Joining me today from his office in Asia is long-time Weiss Research analyst, Larry Edelson. Over the last two weeks, thousands of our readers have been joining Larry on his blog in a hot debate about the fate of the dollar. Our readers are deeply concerned about the dollar’s current decline … how that decline could slash their wealth … and how it could impact their quality of life. They wonder when and how they will be able to save for their future, for their children and grandchildren. They ask: Can the United States survive the decline of its currency? Could the dollar’s decline mark the end of our nation’s greatness as a world power? And now with gold and natural resources going through the roof, they’re also asking: What should I buy today to profit from this surge? These are not questions just for the future. They are questions we must address right now. The dollar is already falling in value against all major currencies. The dollar’s role as a reserve currency is already being challenged in Europe, in Asia, and in the Americas. The dollar’s day of reckoning is already here. Larry Edelson was among the very first to warn about this day. Throughout the 1980s and 1990s, he continually wrote that America’s massive debts will someday become unsustainable. He consistently explained that the favorite debt solution of both Democrats and Republicans will be to pay off government debts with ever-cheaper dollars. He repeatedly warned that, in a desperate attempt to escape the nation’s massive debt burden, Washington will literally declare war against the U.S. dollar! He further warned that, step by step, international investors will abandon the U.S. dollar. And perhaps most alarming of all, he wrote about the ultimate day of reckoning for the dollar — the day when foreign countries and international organizations will push aggressively to replace the dollar with a new reserve currency, ending America’s supremacy as a global economic power. Now, each and every one of Larry’s forecasts is coming to pass. And now, other voices — some very prominent voices — are saying, in essence, the same thing Larry was writing years ago. We have tapped Weiss Research’s research department to compile the relevant expert comments made recently on C-Span, CNN, NBC News, Bloomberg, and other major sources. So let’s review them right here and now. Even the United Nations has effectively declared war on the dollar with a new, game-changing report that recommends a new artificial reserve currency. Martin: Larry, welcome and congratulations on your foresight! I prayed that you would be wrong. I hoped that Washington and the world would not wage this war on the dollar, that this day of reckoning would never come. But now it’s here. I have not given up hope for the dollar or for the United States, but at the same time, I recognize that, as investors, we can’t survive on hope alone. We must be pragmatic. We have to take protective action for ourselves and our family. That’s why I’ve invited you here today, not just because you saw this coming, but more importantly, because you have helped investors convert your vision into action. Larry Edelson: Thank you for that recognition. Martin: What I especially want to recognize is the fact that you have demonstrated, in actual practice, that the best defense for investors is to go on the offense, to convert the dollar decline into a myriad of wealth-building opportunities. We’ll talk about some of those later. Plus, before we finish today, I trust you will be giving us specific, actionable recommendations. Larry: Yes, I will, and I will also tell you when. Martin: Which brings me to a fundamental timing question: All the debts the United States has today have been built up over many years. All the trends we are seeing today have been decades in the making. So I ask you: Why is this suddenly a crisis now? Larry: These years of dollar decline you’ve seen so far are merely the prelude — the build-up — to the day of reckoning for the dollar … to the convergence of events we are now seeing today. Martin: Show us precisely why. Larry: Because of the convergence of four factors. First, we no longer have merely a mountain of debts. We have a volcanic eruption of debts. You saw that eruption in the form of a massive financial crisis which swept the globe just months ago. And now, you are seeing that same eruption in a different form. Martin: In the explosion of the U.S. federal deficit! Larry: Yes, if the U.S. federal deficit were growing by 20 percent or 30 percent or even as much as 50 percent, the pundits could have argued that it was just the continuation of a long-term trend, that it was simply more of the same. This year’s deficit is over three times last year’s level — and last year’s deficit was already the largest in history, in dollar terms. Martin: That’s not just more of the same. Larry: No, it’s a whole different ball game, a clear break with the past. That’s the first major change. Second, we’re witnessing a sea change in the global economy. Larry: … which is now being reflected in the all-critical shift out of the dollar as the world’s reserve currency. Put yourself in the shoes of an international investor. Even if you can choose the right dollar investment, the falling dollar is slashing your returns. You’re fed up. You’re anxious to diversify out of the dollar. But you’re not the only one. Central banks are doing the same. Remember: The U.S. dollar is not only the money we keep in our bank accounts or carry around in our pockets; it has also been the money foreign central banks keep in their reserves. Martin: The dollar has been the world’s dominant reserve currency. Larry: Exactly. Which means the world has had to take our dollars whether they liked it or not. They had no other choice. So that gave us a huge strategic advantage as a nation. Unlike all other nations, we were shielded from the consequences of our follies. We could postpone our day of reckoning. We could party, binge, and abuse … yet never suffer a hangover or side effects. Now, that protective shield is melting away. Now, we face the danger that all our past excesses could come crashing down on us in one fell swoop. You can see that clearly in what the world’s experts are saying and what the world’s leaders are doing … as you so vividly demonstrated a moment ago. You can see it even more clearly in the dollar’s decline in currency markets. Larry: Force #3 is the dollar cycle. Our work with the Foundation for the Study of Cycles, based on centuries of data, leads to the conclusion that the dollar won’t hit bottom until the end of 2012. That’s three more years of potentially traumatic declines. Factor #4 is the hidden debts that could suddenly burst onto the scene and destabilize financial markets. Martin: Can you be more specific? Larry: Everyone talks about our debts to Japan or to China. But our foreign debts go far beyond that. According to the U.S. Treasury Department, our total liabilities to foreigners are now $7.9 trillion — not just to countries like China and Japan, but also to Eurozone and Latin America… not just to central banks, but also to private companies and individuals. It’s a massive mountain of foreign debts that everyone just takes for granted. Another, even larger example of hidden debts is the true obligations of the U.S. government. Martin: When experts talk about the “national debt,” they are referring exclusively to funded debts — the debts for which the U.S. has issued securities like Treasury bonds or agency bonds. Larry: But there again, the problem goes far beyond that. 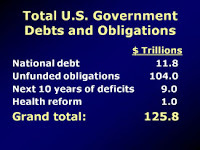 In addition to the gargantuan funded debts you see on the government’s balance sheet, Washington has another $104 trillion in unfunded obligations. Martin: Social Security, Medicare, Medicaid, Veteran’s benefits, government pensions. Larry: Correct. And to make matters worse, the first wave of Baby Boomers are turning 63 this year. Washington is going to have to begin paying out that money starting now! Martin: This helps explain why Washington is now doing something that, on the face of it, seems to be patently insane: trying to spend, borrow, and print its way out of a debt disaster. Larry: And why I see a convergence of forces toppling the dollar. It all comes down to what President Obama himself admitted: The debts our country has racked up are unsustainable. Or more to the point, they are patently unpayable. It will simply be impossible for our government to ever get out of debt by any conventional means. Martin: But do you really believe the government is going to take radical measures to make the debts go away? Larry: Why is that so surprising? Haven’t they already taken radical steps — steps that no one would have ever imagined possible just a few years ago? Look at how they bailed out Bank of America, Citigroup, Merrill Lynch, and AIG. Look at the trillions they poured out in loans, investments, and credit guarantees. Look how they’ve given the Fed new superpowers. Martin: But now Mr. Bernanke and Mr. Geithner are claiming victory. They’re saying that the crisis is over and that all those extraordinary measures were a necessary evil. Larry: They have indeed eased the debt crisis, but only by creating still another crisis — the dollar crisis, which is just beginning. Yet they haven’t made a dent in the mammoth problem that gave rise to the crisis in the first place —overwhelming, burdensome debts. All told, each and every household in America is now indirectly responsible for over $1 million in government debts and obligations. We’ve got the officially recognized national debt at $11.8 trillion … unfunded national obligations of $104 trillion … another $9 trillion in cumulative deficits over the next 10 years … plus another trillion dollars for health care reform, no matter what bill finally makes it through Congress. Grand total: $125.8 trillion. Larry: … which, as we know, is a pipe dream. Even the White House admits we’re looking down the barrel of one-trillion-dollar deficits for years to come. That’s why I say that, no matter how you look at it, this debt mountain is patently unpayable. It will never be paid off, other than through some form of default. Martin: Could you explain that please? Larry: There are two ways a government can default on its obligations: The first way is simply to stop paying its bills and obligations. That’s highly unlikely, for obvious reasons. The second is to default on the sly — by paying off creditors with cheaper dollars, dollars that have less buying power. But this is not just theory. It’s practice. And the idea of debasing the currency in order to delay a debt collapse certainly was not invented by Washington. Time after time, history shows us that when a government cannot print money fast enough to overcome its exploding debt burden, it has no choice but to take more drastic steps to slash the value of its money. Martin: Let’s take a quick peek at that history. Announcer: Since the dawn of civilization, every major nation that has been saddled with unpayable debts and obligations has ultimately resorted to currency devaluations in some form. In ancient Rome, the Roman denarius was the dominant currency not only of the Roman Empire but even beyond its borders. But when Rome began to fall, so did its currency. From its heights in the fourth century A.D., the Roman denarius plunged to 1/50 of its former value — in just 13 short years … and then ceased to exist. Later, during the Byzantine Empire, their money was, in many aspects, the world’s reserve currency for 1,000 years. But in the 12th century, when the empire began to suffer under the weight of overwhelming, unpayable debts and obligations, it was also devalued by reducing its gold content until it effectively ceased to exist in the 14th century. More recently, the fate of the British Empire and the fate of the British pound were also intertwined. In the late 19th century, London devalued pound sterling and then did it again in the early 20th century. From its heyday at the height of the Empire to its low point in recent years, the pound ultimately gave up 80 percent of its value. So you can see that this is a well chartered path: The rise and fall of empires; the rise and fall of their currencies. What is most alarming, though, is what happens when countries lose all semblance of discipline and when they are ultimately punished by market panics. In Germany after World War I, the government printed money in massive quantities to repay war loans and reparations with worthless currency — and to help industrialists to pay back their own loans. The reichsmark plunged from 4.2 to the U.S. dollar at the outbreak of World War I to 1 million per dollar by August 1923 … and then to as low as three trillion to 1 in the final panic before the rise of the Nazi regime. Larry: Now let’s look at the current era: In the past 10 years, the dollar has progressively lost 36 percent of its value against other major currencies and 75 percent of its value against gold. And in the years to come, it’s bound to lose much more. I repeat: A wholesale currency devaluation is the only politically expedient way to address a debt crisis as massive as we face today. Bush, Obama, and Bernanke have already committed us to this path. Martin: Can you give us evidence of that? Larry: Evidence? Are you kidding? Look at last year when the U.S. economy was threatened by systemic risk from the credit crisis. Bush and Bernanke were faced with two simple choices: Either to step aside and allow a sudden, savage depression … or to spend countless sums that the government didn’t have — that it would have to borrow and print, that would almost surely lead to a future erosion in the value of our money. They chose the latter. They chose to sacrifice our future for the expedience of the present. And this year, when faced with similar choices, the Obama team did the same. They spent hundreds of billions of TARP money. They passed a second stimulus bill AND a $300 billion omnibus spending bill. And then, just for good measure, they bailed out the automakers. There’s your evidence: Two very different presidents — one, Republican, one Democrat — choosing the same path, the only politically viable path, the easy way out. Both presidents chose to fight the impending depression by borrowing and printing money … while both knew full well that this has set us up for what could be an even more devastating future crisis — the crisis of the dollar, the crisis of inflation. Martin: Which is actually worse in some respects, isn’t it? Larry: This isn’t just an economic discussion we’re having here. It has real and dramatic consequences for everybody listening to us right now. When the value of a nation’s currency falls by half, its people’s money goes only half as far; their cost of living doubles. When a currency falls 70 percent, 80 percent, 90 percent, or more as in the examples we just looked at, the people who earn it have to pay up to 10 times more for many of life’s necessities — food, energy, and more. The saddest victims are folks on fixed incomes, who worked, scrimped, and saved for a lifetime to ensure they’d have enough to live on in retirement. Suddenly, the nest egg they thought would provide a comfortable life is barely enough to keep body and soul together. Any way you look at it, this kind of currency devaluation is like government-sponsored theft. Martin: Like a burglar who slips undetected into your home and picks up your spare change — every night, 7 days a week, 365 days a year. In public, Washington will never admit to it, but both President Obama and Fed Chairman Bernanke are actively waging their secret war on the dollar right now as we speak. And as an investor, you have no choice but to take defensive steps starting immediately. Larry: Step one, at a bare minimum, I believe that everyone should put 10 percent of their investment portfolio in gold and gold-related securities. Martin: And how much would be too much? Larry: Even if you want to be aggressive, I would not go beyond 25 percent. There are too many other contra-dollar opportunities you’d be missing. Martin: Suppose I have, say, $500,000 in stocks, bonds, and other liquid investments. Please give me a more precise breakdown. Larry: Each investor needs to take a look at his or her individual investment needs. There’s no such thing as a one-size-fits-all portfolio. But let’s assume the 10 percent. You’d have $50,000 in the gold sector. Of that $50,000, I’d put about $3,100 in bullion, in ingots, or in bullion coins like the American Eagle or Canadian Maple Leaf. Given the storage hassles and costs, there’s no need to put more than that in bullion. I’d put another $3,100 into the SPDR Gold Trust ETF, symbol GLD, and another $3,100 into each of three favorite gold mutual funds: the Tocqueville Gold Fund (TGLDX), the U.S. Global Investors World Precious Minerals Fund (UNWPX), and the U.S. Global Investors Gold and Precious Metals Fund (USERX). Then, I’d put the rest into my top-rated gold mining shares. Martin: How high do you think gold could go? Larry: I have three gold price scenarios. First, I believe that, no matter what, gold is going to hit its inflation-adjusted high of $2,300 an ounce — at a minimum. But that assumes an orderly decline in the dollar and an orderly process of phasing in a new world reserve currency of some kind. In scenario two, that process is more chaotic and muddied, with rising global uncertainty regarding the outcome. In that scenario, despite sharp pullbacks, you could see gold reaching $3,000 an ounce. Martin: Many people think $1,000 an ounce is already very high. Larry: Adjusted for inflation, gold at $1,000 per ounce is actually selling at less than half its all-time high. Moreover, at $1,000 an ounce, gold investors are banking on an orderly transition to a new reserve currency over many years. That’s highly unlikely, in my opinion. In scenario three, markets take over, panic sets in, and investors lose any semblance of trust in process of transitioning to a new reserve currency. Martin: How far do you think gold could go in that scenario? Larry: In that scenario, all bets are off! The dollar could overshoot dramatically to the downside, while gold and other natural resources could overshoot dramatically to the upside. I wouldn’t be shocked to see $5,000 an ounce for gold. So in my lowest scenario for gold prices, I think your bullion has the potential to double. And in a worst-case scenario for the dollar, you could be looking at a 5-to-1 gain on your bullion positions. Martin: All this is about step 1, investing in gold. What about step 2? Larry: Step 2 is to diversify beyond gold to other natural resources. Washington’s war on the dollar will drive up a wide range of tangible assets — and companies backed by those assets. Assets that have intrinsic value and assets where the dollar crisis is manifesting itself! Look, over the last decade we’ve seen tech companies go bust. We’ve seen the leveraged mortgage markets go bust. And we’ve seen the financial sector collapse. So savvy money now wants tangible assets and resources that provide the world with the basic necessities of life. It’s where people like Jimmy Rogers are investing. It’s where surviving hedge funds are going. And most important in my opinion, it’s where the giant sovereign wealth funds are shifting a lot of their money, especially China’s. That gives you a double tailwind to propel your investments: Resource companies propelled higher by (a) the falling dollar and (b) the demand from China and other Asian countries. Already, Beijing has quadrupled its gold reserves. And already, Beijing is gobbling up copper like there’s no tomorrow. 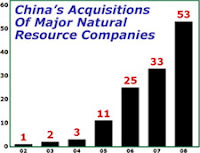 China is buying oil and oil reserves, cutting deals left and right all over the world, scooping up natural resource companies and investments. It’s not just a strategic ploy to secure supplies. It’s also a hedge against the decline of the dollar. Martin: And this is having an impact on commodity prices. Larry: A huge impact! Beijing has $2.14 trillion of cash in the kitty, and most of that cash is now in dollars, which are falling. They cannot liquidate those investments all at once. But they can shift progressively over time. At the same time, China desperately needs those natural resource supplies to feed its rapidly growing economy and the rising lifestyles of 1.3 billion people. Martin: In our Weiss Global Forum, you talked about the huge growth in China’s acquisition deals. Can you run through that again briefly for those who missed the Forum? Larry: In 2002, China made only one deal; In 2003, 2 deals; 2004, 3 deals; 2005, 11 deals. In 2006, that more than doubled — to 25 deals; 2007, 33 deals; 2008, 53 deals. And not only are there more deals, but the average value of each deal is growing by leaps and bounds. These figures also include related companies, like railroads that ship resources. And they’re being done all over the world — in Brazil, Peru, Venezuela, Australia, Africa, you name it. And in virtually all commodities — from oil to soybeans, copper to lumber … from rubber, wheat, and corn to timber. Make no mistake about this: The combination of the disappearing dollar and the huge demand for natural resources from Asia is unlike anything this planet has ever seen before. And it is a key reason copper has surged 94.6 percent this year … oil has roughly doubled from its lows in January of this year … sugar has exploded higher, up over 70 percent … even cocoa is jumping, up over 30 percent this year. Martin: And the more you can lose! Larry: Of course, but if you use leverage carefully, that relatively small amount invested can potentially multiply your returns many fold. Martin: Please give us some specific examples. Larry: First, use no leverage whatsoever, just sitting in bullion. I am aiming for a minimum gain of about 130 percent — from $1,000 per ounce to $2,300 per ounce. Any gold you can buy for less than $1,000, consider it a bargain. That’s the first tier of your strategy — long term with leverage. Martin: And the second tier of the strategy? Larry: The second tier is to use the moderate leverage that’s inherent in most resource stocks. In gold mining companies, for example, you take advantage of the reserves they own, the profits they stand to make, and the fact that those profits can rise a lot faster than the price of bullion itself. No guarantees, but I think with the gold mining shares, you have the opportunity to multiply that 130 percent gain three or four times over. Martin: For those not familiar with this, explain why the shares are more leveraged than the natural resource itself. Larry: Say the company’s cost of mining gold is $400 per ounce. And say gold is selling for $500. What’s their profit? Larry: Now say gold goes up 10 percent to $550 per ounce. How much is their profit now? Larry: So there you have it. Price of gold — up 10 percent. Profit — up from $100 to $150, or 50 percent. For each 10 percent rise in the price of gold, the company’s earnings are rising 50 percent. That’s effectively five times leverage. Martin: Larry, you are the founder and editor of the Real Wealth Report. And in your Real Wealth Report, you recommend a wide variety of resource investments. So beyond just citing a few examples, we have gone to our research department to compile your entire track record for the year, including all the losers. Do you have that for us? Larry: Yes. Here are all the trades this year as of September 29. Martin: Let’s have a look at this. In the first one, Company “A,” you have a loss of 18 percent. Then I see a series of small losers and small winners. But starting with Company “L,” it looks like you have had some excellent performance. A 40 percent gain with Company “L.” A 127 percent gain with Company “M.” Company “N” — 152 percent gain. Then some smaller gains and small losses, but as we go down towards the bottom of the list, some more nice winners — 35 percent gain, 48 percent gain, 196 percent gain. And these are strictly with natural resource companies, correct? Larry: Strictly their stocks, without any leverage — except the natural leverage that comes with stocks we talked about earlier. Martin: A few important warnings I’d like to point out here. First, as with any stock market investing, there’s a risk of loss. Larry: Yes, and if you cannot tolerate that, you should not buy stocks. Martin: Second, if you’re playing this market strictly for the upside and it takes a big dump to the downside, you will see losers. Larry: Yes, that can and does happen. My goal is to ride the great bear market in the dollar and its natural corollary, the great bull market in natural resources. Larry: I believe you’ll see a flood of double- and even triple-digit gains. Martin: What do you do to protect your capital? Larry: My entire point today is that if your capital is denominated exclusively in U.S. dollars and it does not include a strategy for protection against the falling dollar … you may be preserving it in name only. To truly preserve your capital and its purchasing power, you may decide you need to go on the offensive with this kind of strategy. Just like China is. Martin: You haven’t really answered my question, though, about capital preservation. Larry: I use very tight stop losses on nearly all my stock trades. Plus, one of the best ways to reduce risk is to diversify the instruments you’re investing in — not just individual stocks, but also mutual funds … not just ETFs on resources, but also ETFS on resource stocks … not just resource companies based in North America, but also resource companies all over the world … and sometimes, when needed, not just stocks that benefit from rising resource prices, but also stocks that benefit from falling resource prices. Martin: Larry, I can see why you’re so enthusiastic. Gold has busted through the $1,035 barrier; and now there’s nothing on the charts — and nothing in the real world — that can stop it from exploding higher. Other natural resources are surging in tandem and the companies that produce them are rising even faster. Just in one day this week, on a day that gold surged about 2 percent, resource shares surged 8 percent and more — all between the opening bell and the closing bell in one single trading day. So thank you, Larry. I appreciate your enthusiasm. Your timing in presenting this seminar couldn’t be better. And I’m sure everyone is anxious to see your next recommendations. And thank you, our members, for joining us today. This could be a frightening turning point in our history. But I trust that, with Larry’s help and with the help of the entire Weiss Research team, you can avoid the dangers — and profit — as Washington wages its secret war on the dollar. 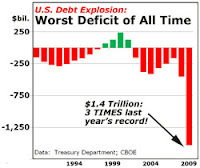 * The Treasury Department estimated the 2009 federal deficit at $1.58 trillion, but subsequently used accounting maneuvers to close the fiscal year with a deficit of $1.4 trillion. How Goldman Sachs made 3 Billions in 3 Months ?